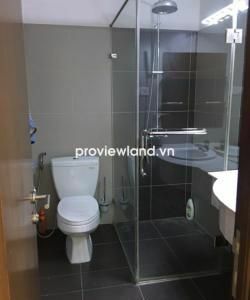 For rent, GK Home serviced apartment has facilities conveniently, located in the heart of District 1 near Nguyen Van Cu bridge, 1 bedroom in an area of 40m2. 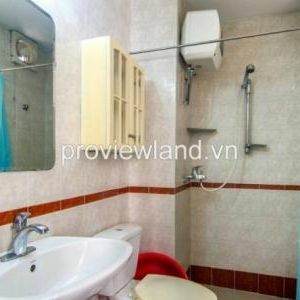 Serviced apartment on Nguyen Van Cu street has the nice living space, color harmony inside the apartment, bright with logical layout makes the apartment became warm and lovely, would do please those who are looking for a comfortable apartment. The living room at serviced apartment in district 1 is arranged with a large brown sofa opposite the luxury television. The living room is the open space connected with kitchen and dining room. The kitchen with the airy space, lots of kitchen cabinets to store the food and full of kitchen utensils such as microwave, refrigerator, hood, stove … The dining table is placed beside the window, this is a very beautiful location and romantic. From here, you can sit to enjoy dinner and admire the beauty of Saigon at night. The airy bedroom with wood floors, large window and the long silky curtains. The walls are decorated with wall paintings are colorful and a large wardrobe. 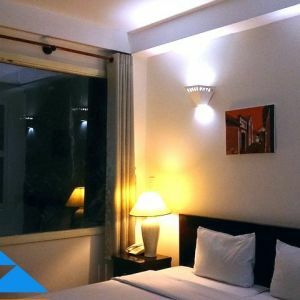 Inside the bedroom and the living room are equipped with air conditioners, your apartment will always be at the best temperature.